CORALVILLE, Iowa, Sept. 11, 2018 (GLOBE NEWSWIRE) -- KemPharm, Inc. (NASDAQ:KMPH), a specialty pharmaceutical company focused on the discovery and development of proprietary prodrugs, today announced topline results from its oral human abuse potential (HAP) clinical trial of serdexmethylphenidate (SDX, a prodrug of d-methylphenidate, or KP415 Prodrug), the major active pharmaceutical ingredient (API) in KP415, its investigational ADHD product candidate that also contains d-methylphenidate. Results from the oral HAP trial (KP415.A01) indicate that the prodrug component of KP415 may have lower abuse potential compared to Focalin® XR (d-methylphenidate extended release capsules), a schedule II controlled substance, even when SDX is administered at oral doses up to 1.5 times higher than Focalin® XR on a molar basis. 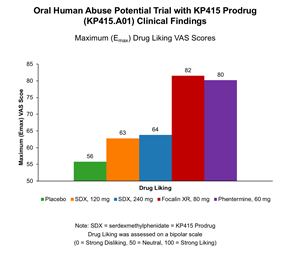 The KP415.A01 oral HAP trial is the second of three human abuse potential trials to be completed and was conducted with SDX, the prodrug contained in KemPharm’s co-lead investigational product candidates, KP415 and KP484. KP415.A01 was a single-center, Phase 1, randomized, double-blind, placebo-controlled, single-dose, 5-way crossover study to determine the abuse potential and pharmacokinetics of 120 mg and 240 mg doses of SDX in capsules compared to an 80 mg dose of Focalin® XR and a 60 mg dose of phentermine following oral administration in recreational stimulant users. Both Focalin® XR and phentermine were administered at twice the highest approved therapeutic dose as outlined in FDA guidance, and SDX at 240 mg was equivalent in d-methylphenidate content (on a molar basis) to 120 mg, or three times the highest approved dose of Focalin® XR. The study consisted of a screening phase, a drug discrimination phase, and a treatment phase. Subjects were enrolled in the treatment phase if they were able to differentiate between the effects of a single oral dose of Focalin® XR and placebo in the drug discrimination phase. Forty-five (45) subjects completed all five treatment periods of the treatment phase. In the trial, KemPharm observed statistically significant reductions in maximal Drug Liking (Emax) for SDX at doses of 120 mg and 240 mg (63 and 64 points respectively) when compared to twice the maximum daily clinical dose of Focalin® XR (80 mg, 82 points), and for the 120 mg dose of SDX when compared to twice the maximum daily clinical dose of phentermine (60 mg, 80 points). In addition, retrospective endpoints of Take Drug Again (Emax) and Overall Drug Liking (Emax) were statistically similar for SDX compared to placebo at both doses. Feeling High (Emax) and Good Effects (Emax) were statistically significantly reduced for both doses of SDX compared to Focalin® XR and phentermine. Additionally, Take Drug Again (Emax) and Overall Drug Liking were significantly lower for SDX compared to phentermine at both doses and similar compared to Focalin® XR at both doses, though Focalin® XR was higher than placebo. In summary, these findings suggest that oral administration of SDX results in effects that are lower compared to Focalin® XR, and at some dose levels, lower or similar to phentermine, a schedule IV controlled substance, as measured by multiple endpoints that are commonly used to assess human abuse potential. These results are preliminary topline data and are subject to further analysis. The full data and detailed results will be submitted for presentation at future scientific conferences and publication in peer-reviewed journals. KemPharm is a specialty pharmaceutical company focused on the discovery and development of proprietary prodrugs to treat serious medical conditions through its proprietary LATTM (Ligand Activated Therapy) platform technology. KemPharm utilizes its proprietary LAT platform technology to generate improved prodrug versions of FDA-approved drugs in the high need areas of ADHD, pain and other central nervous system disorders. KemPharm’s co-lead clinical development candidates are KP415 and KP484, both based on a prodrug of d-methylphenidate, but with differing extended-release/effect profiles for the treatment of ADHD. In addition, KemPharm has received FDA approval for APADAZ®, an immediate-release combination product containing benzhydrocodone, a prodrug of hydrocodone, and acetaminophen. For more information on KemPharm and its pipeline of prodrug product candidates visit www.kempharm.com or connect with us on Twitter, LinkedIn, Facebook and YouTube. This press release may contain forward-looking statements made in reliance upon the safe harbor provisions of Section 27A of the Securities Act of 1933, as amended, and Section 21E of the Securities Exchange Act of 1934, as amended. Forward-looking statements include all statements that do not relate solely to historical or current facts, and can be identified by the use of words such as “may,” “will,” “expect,” “project,” “estimate,” “anticipate,” “plan,” “believe,” “potential,” “should,” “continue” or the negative versions of those words or other comparable words. These forward-looking statements include statements regarding the expected features and characteristics of KemPharm’s product candidates, including KP415, the partnering process for KP415 and KP484, as well as the expected timing of the completion of any clinical trials or studies related to KP415 and the expected timing of the NDA submission for KP415. Forward-looking statements are not guarantees of future actions or performance. These forward-looking statements are based on information currently available to KemPharm and its current plans or expectations Actual results and performance could differ materially from those projected in the forward-looking statements as a result of many factors, including the risks and uncertainties associated with: KemPharm's financial resources and whether they will be sufficient to meet KemPharm's business objectives and operational requirements; results of earlier studies and trials may not be predictive of future clinical trial results; the protection and market exclusivity provided by KemPharm's intellectual property; risks related to the drug discovery and the regulatory approval process; the impact of competitive products and technological changes; and the FDA approval process under the Section 505(b)(2) regulatory pathway, including without limitation any timelines for related approval. Risks concerning KemPharm’s business are described in detail in KemPharm’s Quarterly Report on Form 10-Q for the quarter ended June 30, 2018, filed with the Securities and Exchange Commission (SEC) on August 10, 2018, and KemPharm’s other Periodic and Current Reports filed with the SEC. KemPharm is under no obligation to (and expressly disclaims any such obligation to) update or alter its forward-looking statements, whether as a result of new information, future events or otherwise.